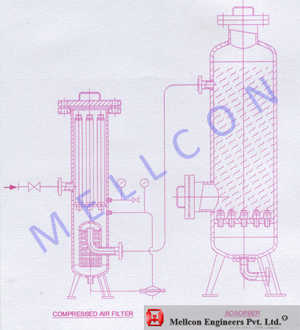 Mellcon Compressed Air and Gas Filters being manufactured are best Tested for simultaneous mechanical separation of liquid droplets and of solid dust from compressed gases. Tested with oil mist, these filters will have to be followed by adsorber units which have the double function of removing the remaining mist particles and of adsorbing the dissolved gases and vapours. Such "Adsorbers" contain granular adsorption media, usually activated carbon or silica gel. The granules nearer to depth filter and liquid mist particles, meanwhile the farther granules adsorb the dissolved vapours. Working pressure : 10 kg/cm2. Material : Carbon Steel. Finish : Inside black bituminious paint. Flanges according to ASA-150 RT Ceramic filter cylinders of grain size 120. All sizes are supplied with separately packed carbon except the In-Line Adsorber, which is supplied with filled-in carbon. One of the most commonly used pressure gas systems where the carrier gas contains solid impurities, mist and vapours at the same time, is that of compressed air. In many cases the requirements call for the best possible separation of the oil carried with the air. The principle fo an effective plant for such a purpose is shown in the diagram. The units for the combined separation of residual mist and adsorption of oil vapour contain a special type of granular activated carbon of about 550g/1 bulk weight. The oil adsorption capacity is about 5 to 10% of the carbon weight. Efficiency : practically complete de-oiling. We supply : Complete filter for the filtration of gases and liquid equipped with filter elements made of porous ceramic or porous plastic materials or with filter cylinders and candles of porous ceramic or porous plastic materials. IN-LINE 500 120 --- --- --- --- 3/4" 2 35/20 Ø 65mm long 3.5 kg. 10 m3/h 12 kg.